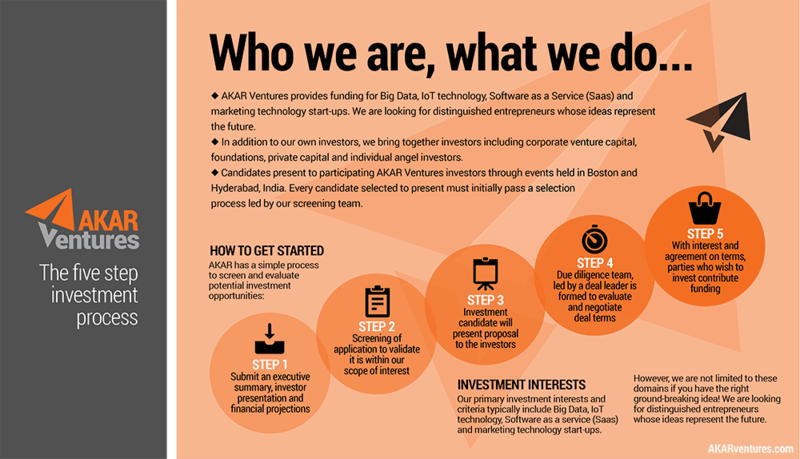 AKAR Ventures provides funding for Big Data, IoT technology, Software as a service (SaaS) and marketing technology start-ups. While these are our primary interests, we are not limited to these domains if you have the right ground breaking idea! We are looking for distinguished entrepreneurs whose ideas represent the future.Apart from our own investments, we bring together other investors including corporate venture capital, foundations, private capital and individual angel investors. Every candidate selected to present must initially pass a selection process led by our screening team. Our investment interests and criteria typically include: Big Data, IoT technology, Software as a service (SaaS) and marketing technology start-ups. Investments between $100,000 and $1,500,000 are considered. A strong, passionate management team. Unique product or service distinguished by an identified competitive advantage. Product or service that addresses a strong market need. AKAR Ventures has a simple process to screen and evaluate potential investment opportunities. The first step to begin investment candidacy is to submit an executive summary, investor presentation and financial projections. If there is interest to move forward, the candidate will be notified. Our team will conduct an initial screening of the application to validate that it is within our scope of interest. Once an initial interest is validated, the investment candidate will be invited to make a presentation. The investment candidate will present the investors will decide whether to proceed with due diligence. A due diligence team, led by a deal leader is formed to evaluate and negotiate deal terms. With mutual interest and agreement on terms, investors who wish to invest will invest.